In the good old days, before 809 High Definition TV transmitters came on the air, co-channel interference was more or less a routine procedure. It started with a Computer Aided TV Reception study, followed by an on-site signal survey verifying the culprits and the intensity of the interference. The photograph below displays a classic co-channel interference situation when only analog TV stations were involved. In the case of digital co-channel interference, there are no ±10 kHz or ±20 kHz beats in the spectrum of the desired analog station. 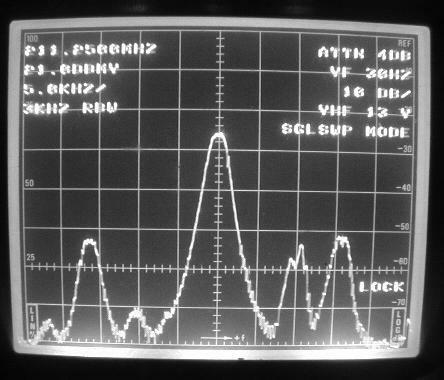 Turn your attention to the photograph below, demonstrating the significant difference between the analog and digital spectrum on the screen of the spectrum analyzer. 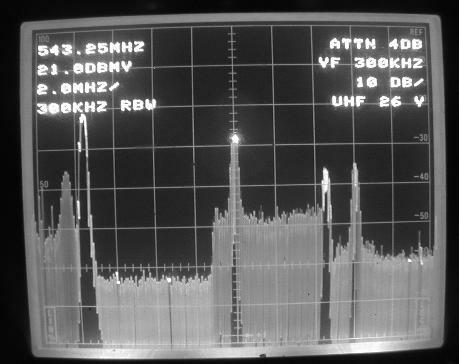 Observe the analog spectrum of Channel 45, Baltimore on the left, side-by-side with its digital Channel 46 affiliate in the center, received by the same antenna. While the analog Channel 45 spectrum contains a well defined video and sound carrier, there are no separate carriers in the DTV spectrum to the right. The power is uniformly distributed over a 4.5 MHz bandwidth. Consequently, a DTV transmission cannot create ±10 kHz or ±20 kHz beats. The interference will show up as a low-level, flat top spectrum between the desired station’s video and sound carrier, as presented below. 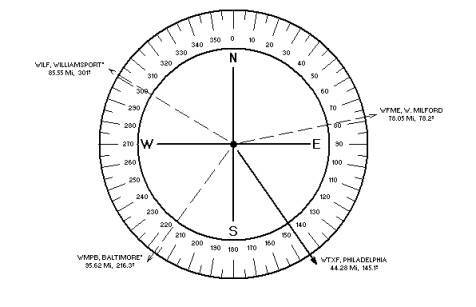 The flat top digital interference of Channel 26-DTV, Philadelphia is firmly embedded between the video and sound carriers of the desired Channel 26, Washington, D.C. spectrum. There are no offset beats in the spectrum. Nor will the Washington, D.C. picture exhibit Venetian Blind type lines in the picture. 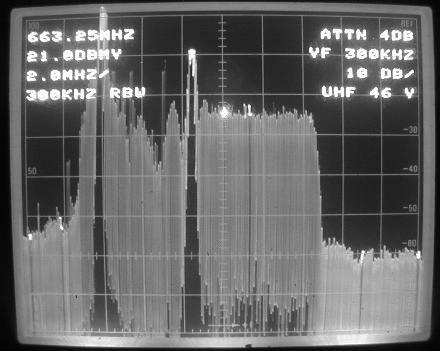 The digital co-channel interference appears as a significant increase in background noise in the desired analog picture. An even more disturbing aspect complicates HDTV co-channel interference conditions: the increasing number of new HDTV stations represent new, potential interference sources. At many locations, where in the past the desired VHF or UHF station was exposed to a single interference source, or no interference at all, the new HDTV stations may critically change interference possibilities. 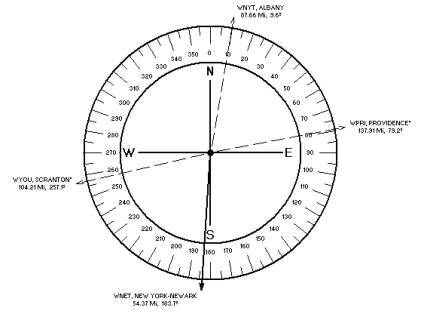 The co-channel signal direction sheet above, prepared for the reception of Channel 13, New York, shows Albany, N.Y. as the singular co-channel interference source. Not anymore. Two upcoming HDTV stations raised the danger of interference to a total of three (3) potential co-channel offenders, as presented on the signal direction sheet below. It is interesting to note what can happen on UHF, where most of the new HDTV stations are concentrated. At the Kutztown, Pa. antenna site the reception of Channel 29, Philadelphia was absolutely free of co-channel interference before HDTV stations became operational. 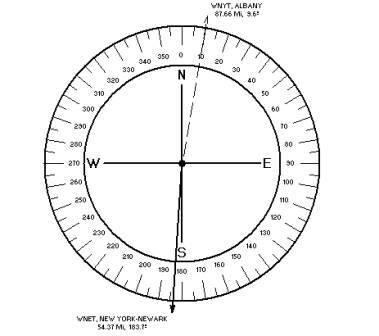 The signal direction sheet above, prepared for analog only conditions, demonstrates that the reception of analog Channel 29 was absolutely free of co-channel interference. Conditions changed drastically in the past six (6) months. The display below shows three (3) HDTV co-channel interference sources in a 96 mile radius. 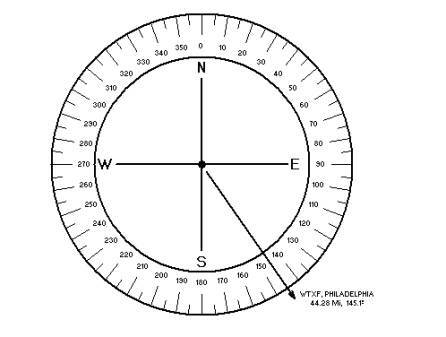 The on-site signal survey verified that only Channel 29, West Milford, N.J. was a serious offender. Your current antennas and antenna-arrays may not produce the required 40 to 50 dB protection against the ever increasing number of digital TV stations. On the other hand, new, more efficient UHF arrays could result in economical antenna solutions, such as the simultaneous reception of analog and DTV stations. A comprehensive and recently updated analog/digital TV database is a prerequisite when addressing the new over-the-air reception environment, to be followed by a well instrumented, expertly performed on-site verification signal survey. The proliferation of digital VHF and UHF channels increased the danger of adjacent channel interference as well, not to be neglected or overlooked, discussed in a separate issue of the Bulletins. In making the transition from analog to digital, the FCC gave every TV station a second channel, with the understanding that the old analog channel will be returned once the transition was finished. This change-over was supposed to be completed by 2006. Virtually nobody expects the 2006 deadline to be met. The simultaneous operation of analog and digital transmitters may continue into 2010 or beyond, ultimately crowding the VHF/UHF TV spectrum with 1300 digital stations. US consumers purchase 25 million new TV sets each year. With average prices of High-Definition sets down 50% to $1,800, sales rose 75% last year. The number of HDTV monitors has grown to 2 million this year. An estimated 100 million TV sets have to be disposed between now and 2006 or 2010 or 2013 to make the transfer for HDTV feasible. HDTV is here, but still a long way to go.